This is a 2 page activity that can be used as a test for students with disabilities in an inclusive science class, as homework, or a study sheet. 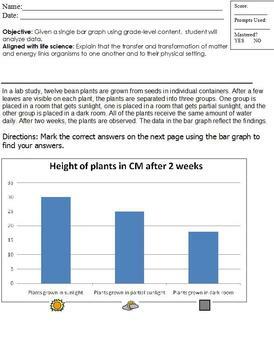 The first page includes a summary of the plant growth experiment and the graph with pictures to assist students. The experiment was modified from a 7th grade inclusion class. It is based on plant growth and compares heights of plants grown in full sunlight, partial sunlight, and in the dark. 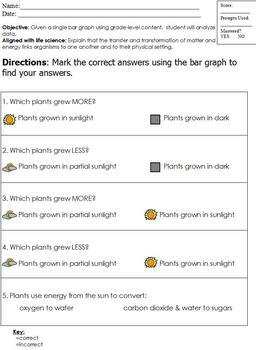 The second page has 4 questions about the graph, as well as a science tie back question about plant energy. Math: 4.B.1.c: Given a single bar graph using grade-level content, student will analyze data. Life science: 3.E.1: Explain that the transfer and transformation of matter and energy links organisms to one another and to their physical setting. There is a helpful box at the top of the page that sums up the student score, prompts used, and if they achieved the goal or not. This is excellent for IEP data.